From the pages of White Wolf's hit RPG comes a new fantasy comic that will shake Creation to its knees. Udon Comics is proud to present a series that will appeal to the thousands of existing Exalted fans as well as brand new readers with no prior knowledge of the RPG line. A young boy named Kidale is anointed with the power of a reincarnated Solar Exalted and becomes the catalyst for conflict and heroism in the glittering glass city of Chiaroscuro. In a world where incredibly powerful exalts stride forth to remake Creation in their image, legends will be forged and sacrifices will be made. 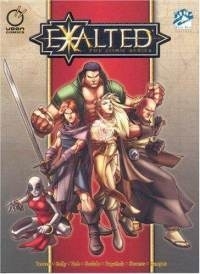 Exalted is action fantasy with a manga flare at its finest. FYI a few pages are cut off at the top or bottom of the page in the PDF.